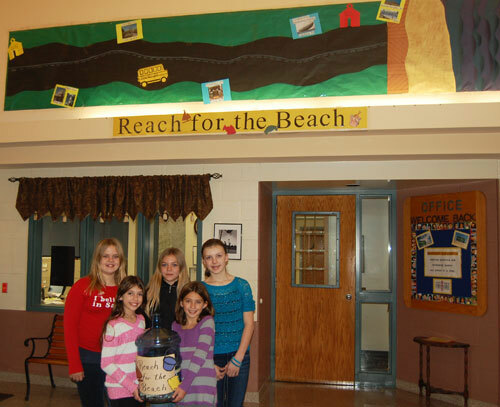 Students and staff at Hambright Elementary are joining forces to “Reach the Beach” by December 12. The school has adopted Seaside Heights Elementary School (NJ) located in one of the areas hardest hit by Hurricane Sandy. All 300 students were displaced from their homes and school. The Hambright staff recently held a dress down day and raised $250. They challenged their students to match that amount by donating spare change. The school’s goal is $500. The proceeds will be used to help provide the affected families with necessities. A poster above the school office tracks the Hambright school bus as it makes its way from Lancaster, PA to Seaside Heights, NJ.